Startups, whether corporate intitatives or small time entrepreneurs, tend to create their branding strategy and do their marketing planning late in the process – often as an afterthought, just before launching their business offering. After all, development is much more fun, right? And branding and communication can be perceived as both time and money invested in intangible stuff outside of the core idea. Or is it? In this era of pioneering spirit, amazing ideas and combos of new tech, products and services are streaming out of garages and co-working spaces everywhere. Project owners and entrepreneurs are invariably resolute regarding profession and tech, but not always so firm when it comes to marketing and branding. Or perhaps they’re either uninterested in life beyond the development stage or unaware of the importance of marketing and branding and the massive impact it can have on the future recognition and success of their business. 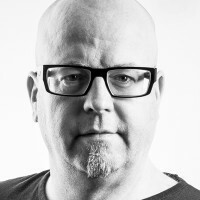 So, come launch, many brilliant projects will have lost precious time because no one thought to create a strong positioning strategy, establish a visual presence, get their brand known, or communicated the core idea of their offerings to supporters and investors to build up a loyal following for a flying start. Of course, we know startups don’t always have a clear plan at the embryonic stage of their business development process. But, once a concept begins to crystalise, it’s vital that you kick off your branding strategy. 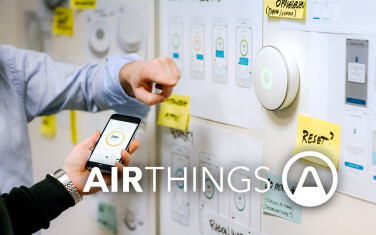 Designing a brand identity early in an integrated process with product, digital and business development proved to be hugely rewarding for Airthings. So, do you need a brand? Absolutely. You are a brand. And working with a brand foundation will not only help give your brand meaning but also develop it in the strategically soundest direction. It will help you understand the market and your customer base (be it investors or end users), and it will give you the tools to make strategic decisions in a more linear way. And in this age of positioning, strong ideas are invisible without dynamic visual branding elements and compelling storytelling that resonates with people. Think TESLA. Ensure that you are well-prepared for the sales work that’ll follow your launch. Make sure your products and communication are aligned. The various touchpoints in which your customers interact with your service should be planned and coordinated. Ensure you have scalable marketing tools in place for further growth. And, have fun while creating all this good work! At EGGS, we guide large and small startups through the initial phase of a project by gathering objectives, visions, understanding, insight and conclusions to form a strategic foundation. This helps with design and business development during later phases and helps startups grow wings earlier. We know that startups work lean, and in parallel processes, development and funding go hand in hand. Two shining examples of what we have achieved for clients in this respect are Blueye and Loadsmart. 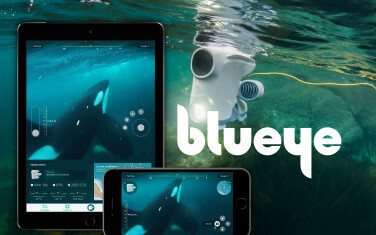 Another shining example of what we have achieved for clients is Blueye Robotics.